Scientists in China have laid claim to a pretty significant achievement, at least in terms of the social and technological implications of it. 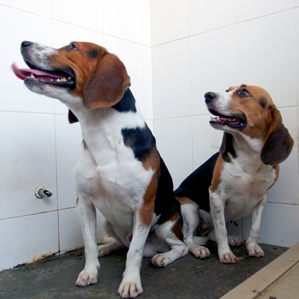 They edited the genes of two beagles named Hercules and Tiangou to produce custom dogs which have far more muscle tone than the average beagle. They actually have double the amount of muscle mass of regular beagles. They were able to achieve this by deleting a gene called myostatin which inhibits muscle growth. The results were reported in the Journal of Molecular Cell Biology. This capacity to edit genes can have many implications in the research, treatment and cure of many diseases. The concern is around the ethics and the compromise that might occur as people commercialize the technique. Another organization crafted and began selling miniature pigs which were crafted using this gene editing technique as novelty pets. ← How Silly Are You In Public for Your Dog?